This was one of the first brick buildings built on this block. The ground floor was built in 1863 for Christian J. Hein and the second storey was added in 1886 for Lowenburg and Harris, realtors. Dennis Reginald Harris, who was also an engineer, designed the addition. The present storefront is believed to be the work of architects Hooper and Watkins and was built about 1905 for Arthur Weaver Bridgman. 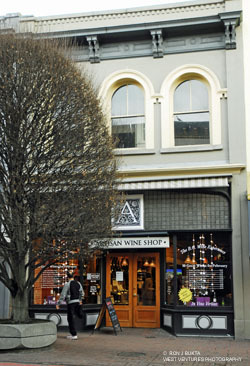 The building has Italianate windows on its upper storey, as do its neighbours, adding to the rhythm of the streetscape. In 1907, A. W. Bridgman’s real estate office occupied the building. Today the building has been restored and now houses a Wine Shop.